Diversified Insurance Solutions is pleased to announce that six new shareholders have been added to the organization. This expands Diversified’s shareholder base and is a key part of the company’s strategy for future growth. The Diversified associates who have now become shareholders are: Andrew Williamson – Account Executive, Anthonie (TJ) Goedheer – Employee Benefit Consultant, Dan Gahlman – Manager Property & Casualty Services, Katie Donovan – Service Manager, Matt Wallace – Sales Director and Matt Weimer – Director Strategic Solutions. 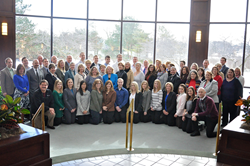 By increasing the amount of Diversified Insurance Solutions’ shareholders, the company can remain committed to remaining privately held and continuing to provide outstanding service to Southeastern Wisconsin. The new shareholders who bought into Diversified Insurance Solutions demonstrated their commitment to the organization as well as their confidence on the future stability and continued growth of the organization. The addition of shareholders is also a key component in establishing a succession plan for the organization to help define the direction of the organization for years to come. Named one of the Milwaukee-Journal Sentinel’s Top Workplaces again in 2016, Diversified Insurance Solutions is one of Wisconsin's largest, full-service insurance brokers, providing employee benefits, HR solutions, risk management and business insurance to area companies. For more information, visit their website.